Description: The column of this sea anemone has a flattened, lightly adherent base; flaring out below the disc. The tentacles are long, up to 200 in number. They are capable of being shed and cannot be retracted into the column. Fully grown individuals are 40mm to 70mm across the tentacles. The colour of the column may be translucent white or pink, the gonads (if present) are of a deep orange/pink colour. The tentacles are white, with a distinct frosted appearance. 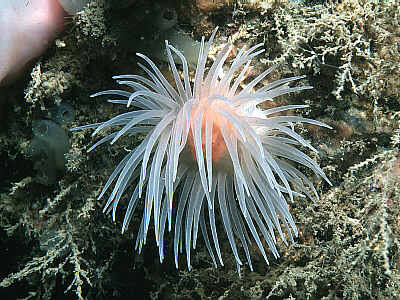 A very active anemone which reacts strongly to various disturbances; it may shed tentacles if removed from water. Habitat: Found on open rock faces, worm-tubes, sea-squirts, dead corals, etc. in sheltered shallow water localities (sea-lochs, fjords) or in deep water, to at least 400m. Distribution: Recently discovered in several localities on the west coast of Scotland. Elsewhere from Scandinavia and Rockall. Any new records would be welcomed. Picton, B.E. & Morrow, C.C. (2016). Protanthea simplex Carlgren, 1891. [In] Encyclopedia of Marine Life of Britain and Ireland.